This is a working relationship with the City of Cape Town, Cape Nature and the Cape Bird Club. 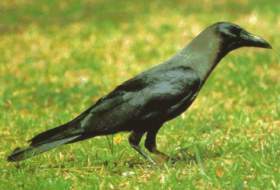 Some years ago the Club, together with the Invasive Aliens Unit of the City of Cape Town and Cape Nature were involved in an attempt to eradicate the House Crow, an invasive species with a reputation for considerable damage in a number of countries. The exercise was reasonably successful but the species was not totally eradicated. We are now receiving reports of the species from a number of sites ranging from Epping to Plumstead. See this Report from Dec 2012.